I love being outdoors. I love the colors, the smells, the sense of peace I feel soaking in the suns warmth and sounds of nature. Whenever I am stressed or unhappy, a day hiking in the woods always makes me feel renewed. (Yes, even with my two year old in tow!) When I train, I often find excuses to take my clients outdoors for a fresh air workout. For Centuries, people have believed that the outdoors holds great healing power for illnesses, stress, and our mental health. Those who were fortunate enough to have the financial means, wandered to upstate NY, outWest and to the coast to seek cures for whatever ailed them. While nature may not have been a cure all for everything, it did, and still does benefit our health. makes us feel more grounded and connected with our community and appreciative of nature. Back in the late 1800s, tuberculosis infected an estimated 70-90% of people in urban populations. Since it then had no cure, it was responsible for killing 80% of those who contracted it. Those with the disease looked to many promising options in order to avoid becoming another statistic. One of these remedies was taking refuge in the heart of the Adirondack’s under the watchful eye of Dr. Trudeau. Dr. Trudeau himself was diagnosed with tuberculosis. He moved himself and his family from Long Island to the Adirondacks to live the remainder of his life in peaceful retreat. However, instead of succumbing to the disease, Dr. Trudeau noticed significant improvement in his strength and health following his move. He attributed his success to the fresh mountain air, isolation, increased physical activity, and good nutrition. Dr. Trudeau proceeded to test his hypothesis and confirm his suspicions, which led to the opening of the Adirondack College Sanatorium in Saranac Lake, New York. The Sanatorium was a rest home to treat and “cure” patients with tuberculosis. Per Dr. Trudeau’s protocol, patients would sit outdoors, no matter the weather, for 8-10 hours a day. They would gradually increase their exercise duration as time went on, and they followed a strict healthy diet that included three meals a day and a glass of milk every 4 hours. (4,5, 6) While he didn’t truly cure his patients of tuberculosis, Dr. Trudeau was on to something; being outdoors, exercising, and eating well is beneficial for longevity. He helped many patients regain strength and prolong their lives. This all sounds great, but the majority of us don’t have the option to quit our jobs and uproot our entire life to move to the mountains. The good news: you don’t have to! Even a short 30 minute unplugged stroll around a green space can have immense benefits in lowering blood pressure and reducing depression. During the 1980’s, a practice called Shinrin-yoku (“taking in the forest atmosphere”) or “Forest Bathing” was developed in Japan as part of a national public health program. (7) The program was designed to encourage people to be healthier as well as protect the nation’sundeveloped land. The belief is, immersing yourself in nature, even briefly, will provide many health benefits. While this process is more meditative than Trudeau’s all or nothing approach, the idea is still the same: nature promotes healing for both the mind and body. “Forest Bathing” provides you with time away from your daily “to-dos “and technology in order to reflect and re-center your mind as well as breathing in the natural fresh air. Other studies have shown that time spent around green space can also increase your creativity, your connection with peers and intuition with your own body. Take a second to reflect on the last time you enjoyed some time outdoors. What were you doing? Were you at the beach? On a hike? Enjoying a walk or picnic in a park? How did you feel? Chances are you were happy, relaxed and refreshed. How can you regularly take advantage of the benefits nature has to offer? 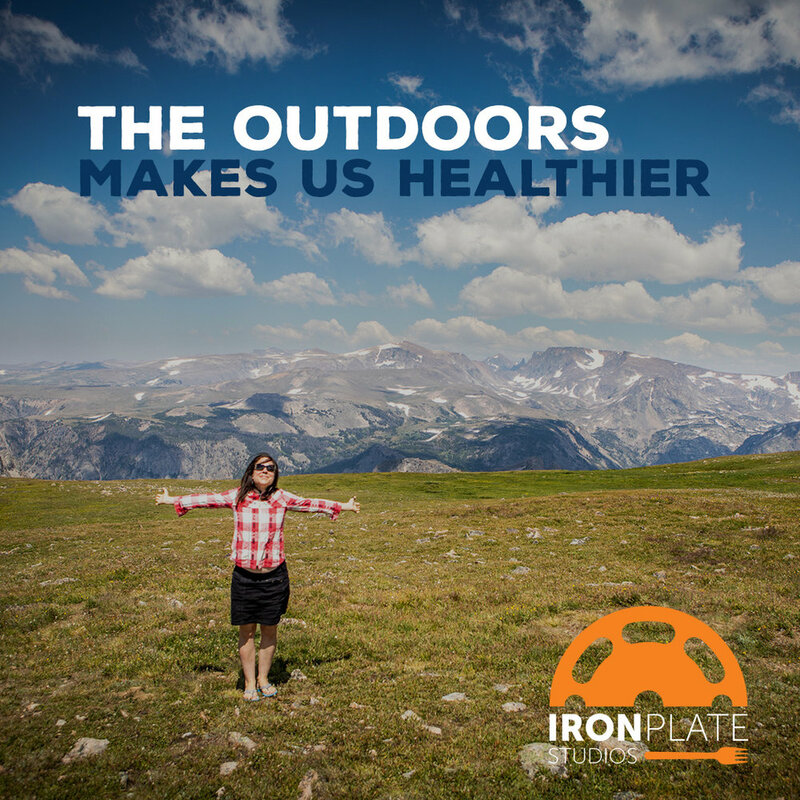 No matter the weather, get outside for even as little as 15-20min. Take your exercise outdoors: run, bike, walk, swim, rollerblade, bring your weights outside, improvise a bodyweight workout outdoors at the park, kayak, paddleboard, workout classes at the park, etc. Kids & pets need outdoors too-plan playground trips, family bike rides, family hikes, sports, etc. Does spending time in nature hold the magic to cure for all that ails us? Probably not, but you can’t deny the changes that happen in your mind and body when you are able to spend some time outdoors away from the hustle and bustle. A combination of good nutrition and some time spent outdoors exercising and reflecting certainly can’t hurt. What happens when we sit all day?